DERBY, CT – It’s a place that’s easy to drive by. 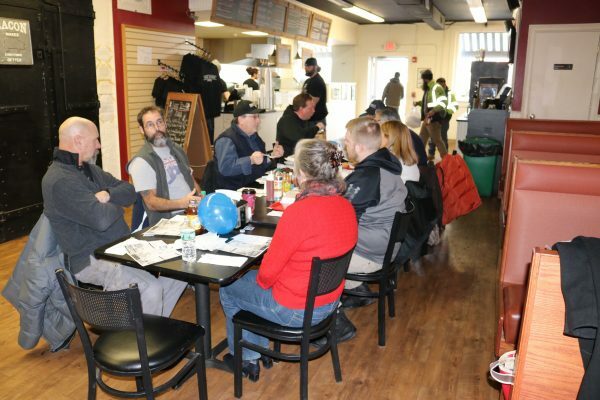 That because House of Bones BBQ is located in an odd spot on busy Route 34, just east of Route 8. Heading south, House of Bones BBQ comes quickly into view as you come around a corner. The problem is that you a can drive by before the urge to pull in has been comprehended. Heading north, its north-facing, three-story facade can’t be seen, making the casual eatery sort of a place that’s truly hidden in plain sight. 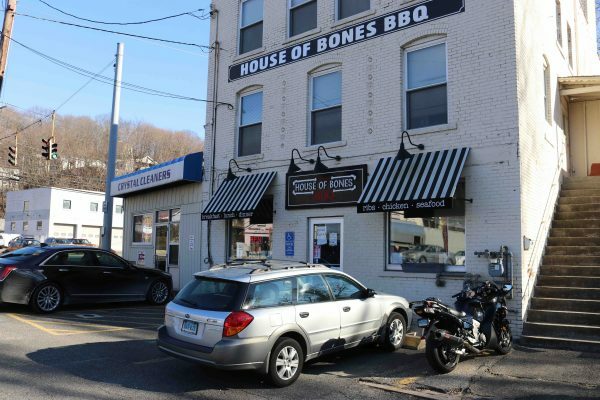 Loads of BBQ lovers have likely driven past the place over the years thinking to themselves, “Gee, I really need to stop there someday.” I’ve been exactly thinking that since 2011 when House of Bones BBQ opened in what began as a meat-packing plant in probably the 1800s. Someday finally arrived on Saturday, and the experience was worth waiting for. “Safe Riding” columnist Steve Smith invited me to join a Concours Owners Group luncheon. Already knowing where I was heading, I made sure not to drive by. 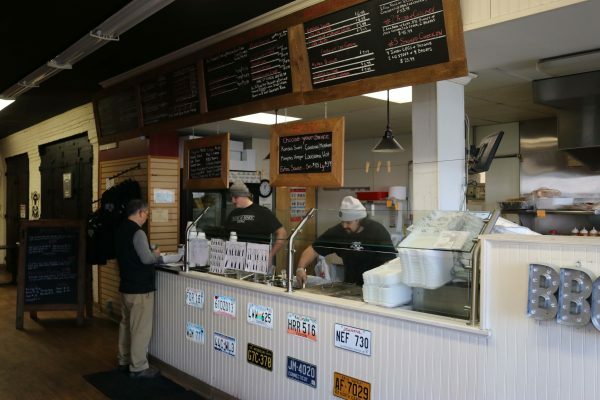 In actuality, the restaurant does good job showing a southbound motorist (which I was) where to pull in the parking lot that sits alongside the Metro North railroad tracks. Inside, the decor is simple with walls decorated with pics and advertisements for the Armour & Company meat plant that used to fill the space. One wall is dominated by large, black metal doors, one of which hides an old elevator. There are both booths and tables. Food is obtained by ordering at the register, then sitting down to await its arrival. 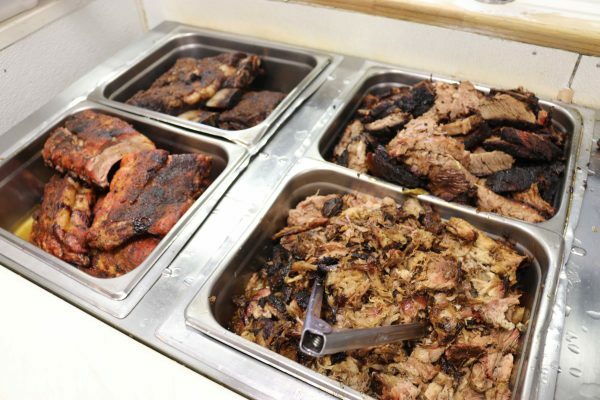 Everything comes plain, with diners able to choose between four sauces – Kansas City Sweet, Louisiana Hot, Carolina Mustard and Memphis Vinegar. 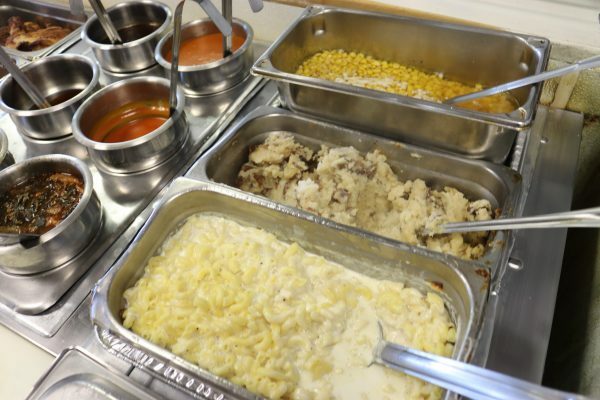 There are also numerous expected side dishes – mac and cheese, cole slaw, BBQ beans, collard greens and mashed potatoes. For the COG group, a large table had been set up. The cold day resulted in only one latecomer showing up on two wheels. The remainder of the group arrived on a staggered basis, which helped those dishing up the grub because there wasn’t a crush. I opted for the two-meat meal for $18.48 (pictured at top), which comes with two sides. My choices were pulled pork and beef brisket with sides of cole slaw and mac and cheese. The order came with cornbread. Portion size was substantive and the food certainly tasty. 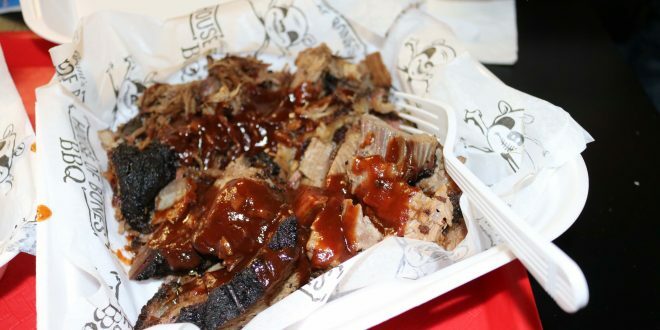 A sandwich board on the floor noted that House of Bones BBQ is offering bulk food for Super Bowl parties. Four pounds of beef brisket costs $59.99, four pounds of pulled pork or chicken is $53.99 and 24 pieces of fried chicken is $45.99 (which is only slightly more than the $40.98 that you’ll pay at KFC). The service at House of Bones BBQ was prompt and the staff was friendly. By the time we were finishing up, the other booths and tables were filling up, but there was no sense that we were being rushed. Visiting House of Bones BBQ was altogether pleasant experience, except for the fact it was too cold to ride there.